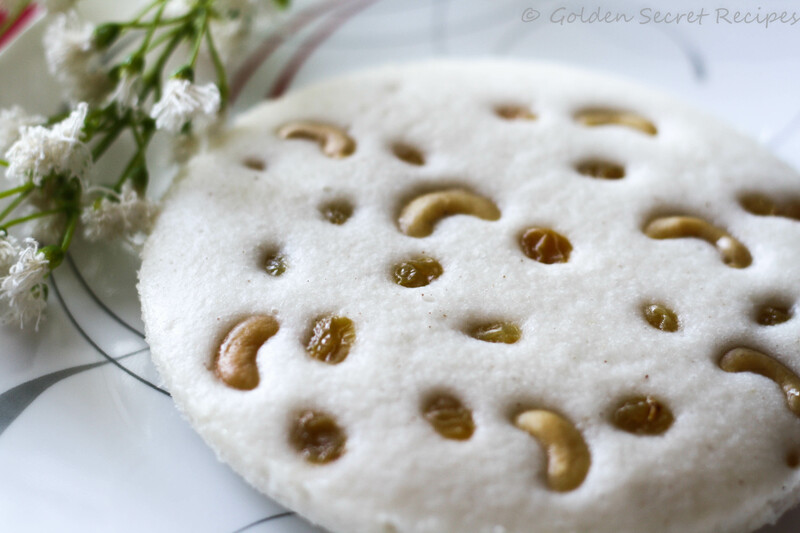 Vattayappam can be described as a steamed thick rice pancake. Its main ingredients include rice and coconut. A simple dish, used mainly as a tea time snack or breakfast in most Kerala Christian homes. DD usually doesn’t ‘demand’ or ‘request’ me to make anything particular. Its very rare that he would ask me to make something FOR him. Whenever I ask him what he wants me to make, his default reply is, “Anything that’s easy for you to make is fine”. Isn’t he a loving husband 🙂 No pressure on me whatsoever! I know that vattayappam is one of DD’s favourites. Its not hard to remember his favourites, given that he has very few items in his list, unlike me or most foodies 😛 So when he asked me to make Vattayappam, I was more than happy to make this for him. Once we were at our friend’s place and they got some snacks. I think it was mini samosas and idlis. All of us sitting there except DD, realized after a while that what we thought was Idli was actually Vattayappam in the shape of Idli. So for fun we demanded the hosts to serve chutney/sambar to eat along with ‘Idli’. After some time also, when I saw that DD wasn’t taking his favourite item kept in front of him, I asked him why he isn’t taking one of those. I knew for sure that it wasn’t for courtesy sake 😉 His next statement, put me rolling on the floor laughing. Very innocently he said, “I am waiting for the chutney”!!!!!! That was hilarious. We all had a good laugh that day 😀 So this one is for you my dear DD 🙂 Presenting your favourite vattayappam! 1. In lukewarm water, mix sugar and yeast(mentioned under ‘For fermenting yeast’ section). Keep it covered and undisturbed for 15-20 mins until foamy. 2. Meanwhile, in a blender/mixie put rice flour, grated coconut, 1 tbsp sugar, cooked rice, salt and enough water. First put 1/2 cup water. Blend/Grind it to a smooth paste. Add remaining water only if required. NOTE: The batter shouldn’t be too watery. It should be just slightly thinner than an idli batter. Remember that the water used for fermenting yeast will also get added to the batter. So add water carefully. 3. Transfer the batter to a bowl. Once the yeast gets foamy, add it to the batter. Give it a good mix. Cover with a lid and let it stay in a warm place overnight(or for 7-8 hours) for fermenting. The batter will rise well, so use a bowl which is large enough to contain the batter even if it rises 2 folds. 4. After the batter rises, add the remaining sugar(2 tbsp) to the batter. Remove the skin of the cardamom and crush the seeds using pestle and mortar and add it to the batter and mix well. 5. Prepare for steaming the batter. Grease a flat cake pan or round glassware(with a flat surface) with ghee. 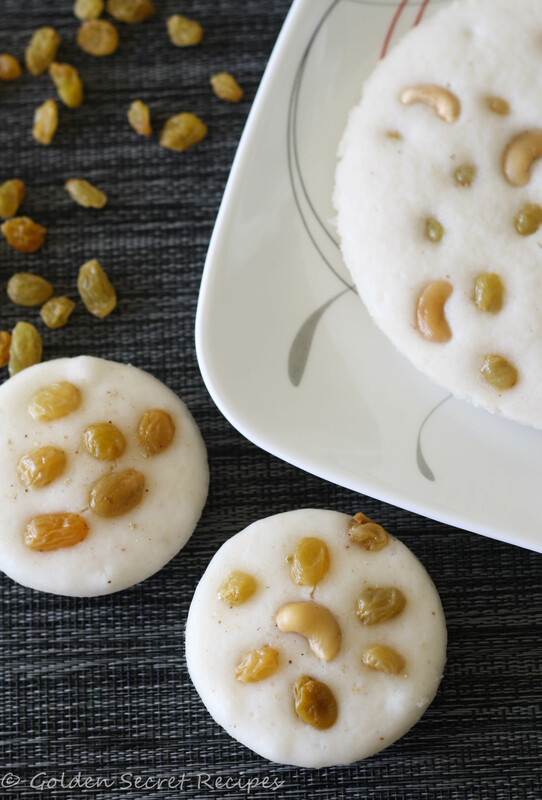 You could also use idli plates for making the vattayappam if you do not have a flat tray that you can use for steaming. I used a 6-inch pan and 1 idli plate for making mine. 6. Pour half the batter to the greased pan. Split the cashews into halves. Garnish with raisins and cashews. Steam it for 20 mins on medium high flame. Let it cool for 10 mins and then transfer to a plate. 7. Repeat steps 5 and 6 for the remaining batter(if you split the batter to make 2 vattayappams). If using idli plates, you can steam it in one go. Depending on what kind of pan you use and the depth of your cooker/steaming pot, you can prepare all the vattayappams in one go or by repeating the steaming process. 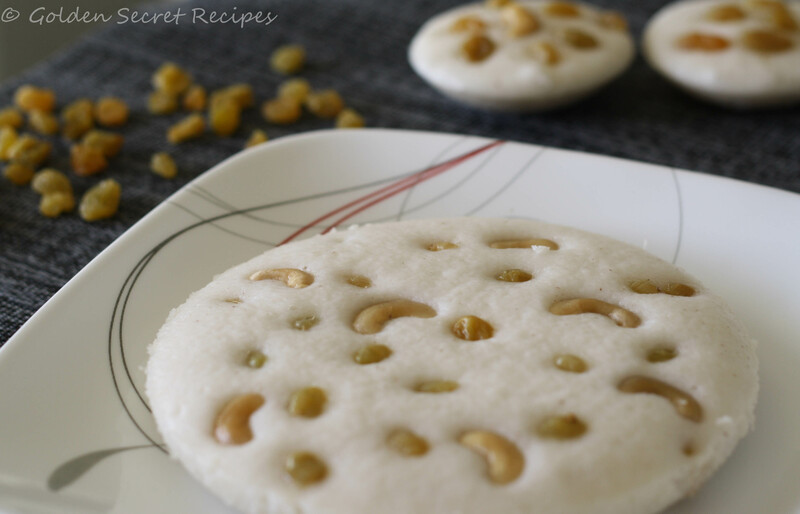 This entry was posted in Appetizer 'N' Starters, Bread 'N' Breakfast, Quick 'N' Easy Recipes, Specialities-Veggie and tagged Easter snack, Kerala snack, Kerala vattayappam recipe, Monty thursday special, Monty thursday vattayappam, Pesaha appam, Pesaha vyazhazhcha appam, Pesaha vyazhazhcha special, Pesaha vyazhazhcha special snack, Pesaha vyazhazhcha vattayappam, Soft vattayappam recipe, Vattayappam. Bookmark the permalink.